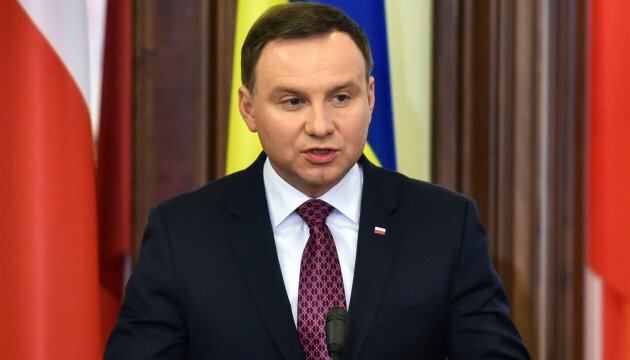 Honoring the memory of the victims in the Volyn tragedy by Ukrainian President Petro Poroshenko is a very important gesture for Ukrainian-Polish reconciliation, Polish President Andrzej Duda told Polsat News TV channel on air. "This is an extremely important gesture, a gesture of peace. I took it as a gesture of friendship and I think that it should be positively evaluated by all. I hope that even those people who perceives these dramatic events very personally will positively respond to the gesture made by Ukrainian President, and we can build on this [foundation our future – ed]," said Duda. He noted that during his bilateral meeting with Poroshenko in Warsaw during the NATO Summit they discussed the issue of complicated pages of history. "Certain events have to be recognized; on the other hand some other events should be abandoned. I hope that Ukrainian laws that had been adopted some time ago will be amended as this is necessary for historical truth and to solve [historical problems - ed.]. If we take these steps, then we will have a chance for voicing the historical truth, but after some time and its perception," Duda noted. Poland marks the anniversary of the tragic events in Volyn in 1943-1944 on July 11. Ukraine and Poland view the tragic events in Volyn and eastern Galicia in 1943-1944 differently. Polish historians blame the killing of civilians solely on the OUN and the UPA, while the majority of Ukrainian historians believe the blame for these crimes is shared by both sides. Poland argues that as a result of the ethnic cleansing 100,000 Poles and from 5,000 to 10,000 Ukrainians were murdered. However Ukraine is talking about scores of thousands of killed Poles and more than 10,000 killed Ukrainians.